Wow, … is it really over already?? Time flies when you are reading a creepy book that’s for sure! 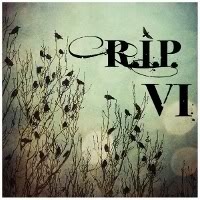 As little as 4 yrs ago (September 2007 to be precise) I read my first RIP book… reluctantly! I don’t like to read about Vampires or Werewolves or Zombies or.. well you get the picture. I got extremely lucky and found a little book called “Gil’s All Fright Diner”. Did it have a Vampire? Why, yes it did. Did it have a Werewolf? Ummm, yup it did. But unlike a “normal Vampire, or normal Werewolf” these two were Funny,and they were reluctant heroes! I thought, ok I can do this! 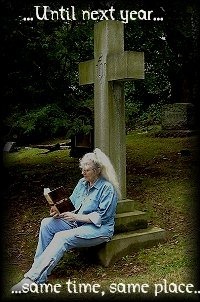 Then Mr. Carl introduced me to Gothic Mysteries… lord help me. … I am hooked, hooked, hooked! Anyway.. here I sit broken hearted… paid a dime and only…well, only read 10 things for RIP! 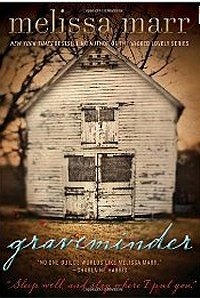 I think if I had to pick just one book to be my favorite of them it would be The Graveminder by Melissa Marr. I think it most fit the ambiance of the challenge. I can never thank you enough for holding this challenge each year, Carl ! Without you it would only be another Halloween. The Butterfly Cabinet by Bernie McGill. 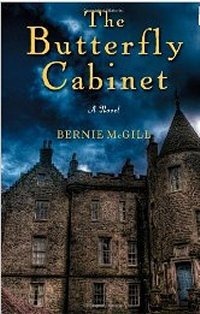 Vivid, mysterious and unforgettable, The Butterfly Cabinet is Bernie McGill’s engrossing portrayal of the dark history that intertwines two lives. Inspired by a true story of the death of the daughter of an aristocratic Irish family at the end of the nineteenth century, McGill powerfully tells this tale of two women whose lives will become upended by a newly told secret. The events begin when Maddie McGlade, a former nanny now in her nineties, receives a letter from the last of her charges and realizes that the time has come to unburden herself of a secret she has kept for over seventy years: what really happened on the last day in the life of Charlotte Ormond, the four-year-old only daughter of the big house where Maddie was employed as a young woman. It is to Charlotte’s would-be niece, Anna—pregnant with her first—that Maddie will tell her story as she nears the end of her life in a lonely nursing home in Northern Ireland. The book unfolds in chapters that alternate between Maddie’s story and the prison diaries of Charlotte’s mother, Harriet, who had been held responsible for her daughter’s death. As Maddie confesses the truth to Anna, she unravels the Ormonds’ complex family history, and also details her own life, marked by poverty, fear, sacrifice and lies. In stark contrast to Maddie is the misunderstood, haughty and yet surprisingly lyrical voice of Harriet’s prison diaries, which Maddie has kept hidden for decades. Motherhood came no more easily to Harriet than did her role as mistress of a far-flung Irish estate. Proud and uncompromising, she is passionate about riding horses and collecting butterflies to store in her prized cabinet. When her only daughter, Charlotte, dies, allegedly as the result of Harriet’s punitive actions, the community is quick to condemn her and send her to prison for the killing. Unwilling to stoop to defend herself and too absorbed in her own world of strict rules and repressed desires, she accepts the cruel destiny that is beyond her control even as, paradoxically, it sets her free. The result of this unusual duet is a haunting novel full of frightening silences and sorrowful absences that build toward the unexpected, chilling truth. This Amazon Review gives a perfect outline of this small but effective book. This book is quite good… but for some reason that I don’t know I have a feeling that it could have been better. I did feel (as you go through chapters) that I got to know the protagonists ( I consider both Maddie and Harriet the main characters). The telling of the two stories alternating chapters was not difficult to read and I never once got confused as to who was talking and what was happening. However in some small way I still didn’t feel that I was “there, in the story” the way most books such as this make me feel. Like I said it’s short and to the point and maybe that’s why I feel as I do. A longer version and getting to know the people better might be called for. But it certainly was a most interesting book. Based on a true story, which makes it even more interesting. I did like it, but I might say if someone isn’t “sure” about it to read a Library copy. Amazon : It’s the beginning of a lazy summer in 1950 at the sleepy English village of Bishop’s Lacey. Up at the great house of Buckshaw, aspiring chemist Flavia de Luce passes the time tinkering in the laboratory she’s inherited from her deceased mother and an eccentric great uncle. When Flavia discovers a murdered stranger in the cucumber patch outside her bedroom window early one morning, she decides to leave aside her flasks and Bunsen burners to solve the crime herself, much to the chagrin of the local authorities. But who can blame her? What else does an eleven-year-old science prodigy have to do when left to her own devices? With her widowed father and two older sisters far too preoccupied with their own pursuits and passions—stamp collecting, adventure novels, and boys respectively—Flavia takes off on her trusty bicycle Gladys to catch a murderer. 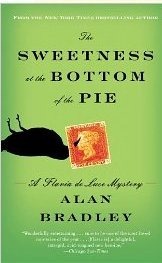 In Alan Bradley’s critically acclaimed debut mystery, The Sweetness at the Bottom of the Pie, adult readers will be totally charmed by this fearless, funny, and unflappable kid sleuth. But don’t be fooled: this carefully plotted detective novel (the first in a new series) features plenty of unexpected twists and turns and loads of tasty period detail. As the pages fly by, you’ll be rooting for this curious combination of Harriet the Spy and Sherlock Holmes. I just finished reading this book about an hour ago. Many have read it and the books that follow it already and loved the books. As many know I have been in a slump plus stressed out to the point it’s hard to get my mind off of things let alone seriously get into what I’m reading and it seriously hampers my enjoyment of the books I’ve been reading… so take this with a grain of salt. 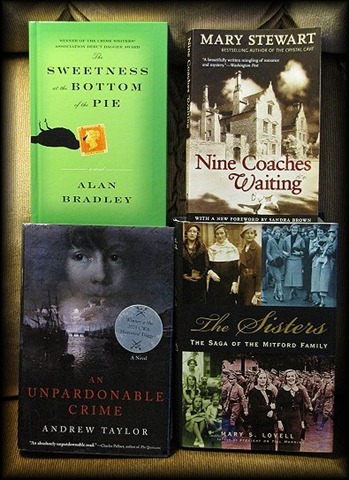 I did enjoy the book and Flavia and her whole family which Mr Bradley very nicely gave very individual personalities to, which in turn flavored the book quite well. The mystery itself was laid out very well and I really did not piece it together any before Flavia did! I did however have a bit of difficulty with her being so adult at such a young age. Was she extremely smart and into chemistry.. yes… in fact, almost more so than is believable….so I did have some difficulties there…but at the times I was not envisioning her of the age she was, then the story seemed better to me. I know I have read many YA books before and this is not the first time I thought the protagonist “too young” or written too old for the age. But I will admit that this doesn’t happen often . Over all, considering my lack of enthusiasm for anything I’ve read lately, I did enjoy this book and I can see where most who take up the book to read will also enjoy it. 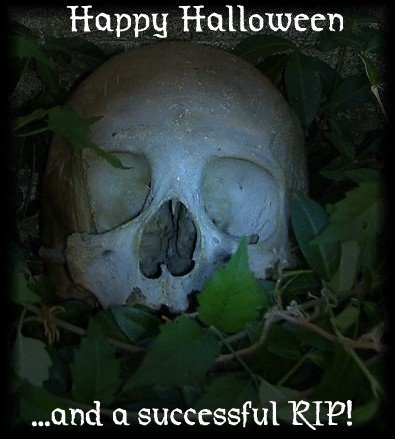 This is a book I am sure many of you will enjoy if you like YA books and a good mystery. I have come to the conclusion that no matter how hard I try I will always have 140 books in my tbr mountain! I get it down by 3 or four and low and behold 3 or 4 new or in this case, used, books come into the house! And so once again I have 140 TBR books! In actuality these books entered my apartment a week or so ago.. I just didn’t get to posting the photo. I really have to keep reminding everyone that my not feeling well has really attributed to how much I enjoy a book. I am reading Sweetness at the Bottom of the Pie right now.. it’s slow going, and although I think Flavia is cute and I realize they made her interested in chemistry so she was more believable sounding more adult, the chemistry aspect has not thrilled me …I can’t say I am as enamored as most who read it… then again..I can’t say I’ve read a book that really excited me in quite some time. I’ve enjoyed books but there hasn’t been a one I’ve decided to “keep”. That being said, I am not quite half way thru the book. It’s not one I will set aside and I am enjoying it to a degree.. it’s just not one of those “i love that book” feelings, and I do attribute a lot of not “loving a book” is due to how I’ve been feeling the past couple of months. and Sweetness at the Bottom of the Pie by Alan Bradley. Nice Coaches and the Sisters were each 1.00 . Sweetness at the Bottom of the Pie was 5.00 and in NEW condition. An Unpardonable Crime I found in Amazon “used” . Including the 3.99 shipping it cost me 4.00 . Yes, I paid one cent for the book. Will I ever get my tbr down to under 100???? I would dearly love that. I would still always get books but I’d sure like the tbr to be lower. I have to admit it wouldn’t be easy because many (MANY) of the books in my tbr are HUGE books! *sigh*. I certainly don’t mind big books but my reading is so slow and it’s so hard to walk out of the used book store empty handed!!! I’m doomed aren’t I?! Miss Jeromette & the Clergyman : a novella by Wilke Collins. I put off reading it until today. I have to say Wilke manages to do what others have not. His *novella* had a beginning, where the future clergyman falls in love with Jeromette. A middle, where he leaves his love to become a Clergyman knowing his love is in love with another. And an end…. which of course I won’t give away. I really do like the way Wilke Collins writes! He is more *readable* then Dickens. A little less dark and in general uses easier words to read by. Believe it or not, since this tale is about a ghost it fits the criteria for yet another RIP read!… this would be number 8 !! But the way if you like Wilke’s writing and click on the link at the top you will find a list of short stories novella’s written by Wilke. You can read them on line or print them off to read . I will leave you with a rather large excerpt that Amazon had posted as their product description..
an excerpt from the beginning: My brother, the clergyman, looked over my shoulder before I was aware of him, and discovered that the volume which completely absorbed my attention was a collection of famous Trials, published in a new edition and in a popular form. He laid his finger on the Trial which I happened to be reading at the moment. I looked up at him; his face startled me. He had turned pale. His eyes were fixed on the open page of the book with an expression which puzzled and alarmed me. "My dear fellow," I said, "what in the world is the matter with you?" He answered in an odd absent manner, still keeping his finger on the open page. "I had almost forgotten," he said. "And this reminds me." "Reminds you of what?" I asked. "You don’t mean to say you know anything about the Trial?" "I know this," he said. "The prisoner was guilty." "Guilty?" I repeated. "Why, the man was acquitted by the jury, with the full approval of the judge! What call you possibly mean?" "There are circumstances connected with that Trial," my brother answered, "which were never communicated to the judge or the jury – which were never so much as hinted or whispered in court. I know them – of my own knowledge, by my own personal experience. They are very sad, very strange, very terrible. I have mentioned them to no mortal creature. I have done my best to forget them. You – quite innocently – have brought them back to my mind. They oppress, they distress me. I wish I had found you reading any book in your library, except that book!" My curiosity was now strongly excited. I spoke out plainly. "Surely," I suggested, "you might tell your brother what you are unwilling to mention to persons less nearly related to you. We have followed different professions, and have lived in different countries, since we were boys at school. But you know you can trust me." He considered a little with himself. "Yes," he said. "I know I can trust you." He waited a moment, and then he surprised me by a strange question. "Do you believe," he asked, "that the spirits of the dead can return to earth, and show themselves to the living?" 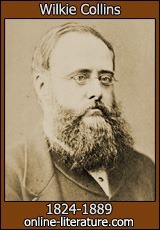 I answered cautiously – adopting as my own the words of a great English writer, touching the subject of ghosts. "You ask me a question," I said, "which, after five thousand years, is yet undecided. On that account alone, it is a question not to be trifled with." My reply seemed to satisfy him. "Promise me," he resumed, "that you will keep what I tell you a secret as long as I live. After my death I care little what happens. Let the story of my strange experience be added to the published experience of those other men who have seen what I have seen, and who believe what I believe. The world will not be the worse, and may be the better, for knowing one day what I am now about to trust to your ear alone." Rebekkah Barrow never forgot the tender attention her grandmother, Maylene, bestowed upon the dead of Claysville, the town where Bek spent her adolescence. There wasn’t a funeral that Maylene didn’t attend, and at each Rebekkah watched as Maylene performed the same unusual ritual: three sips from a small silver flask followed by the words "Sleep well, and stay where I put you." Strangely enough, this book was pretty good. It was quick to read because of short chapters (something I dearly love!). As much of a story this book is about the dead (or the waking dead) I bet you might not believe it’s also a love story. Yup.. a love story! I am not sure how Ms Marr managed to combine the two subjects so well, but she did! I am not usually one for love stories. Well, at last not an out and out love story without a good story behind it… and this was a pretty darn good story! And for longer then Byron would care to remember Bek was not about to admit that she felt the same for him… that’s frustrating enough to make you want to be dead yourself… except that Byron is the Undertaker! Good lord.. I just can’t picture loving an undertaker. I guess I just can’t imagine what the talk would be like around the dinner table. “hon, it that a leg or a thigh?” ewwwwwwwwwww never mind. Anyway this was one of the better stories that I’ve read during RIP. But I still have to admit that the other books are probably better then I stated just because I am still so stressed out that nothing is quite right lately. The Amazon review above gives a good idea of the book… and all I can add to it is that it was surprisingly a very good read. 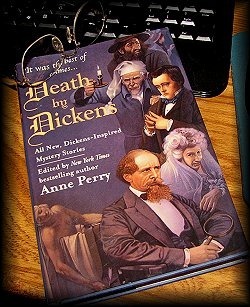 As you may remember back that I purchased a book called Death by Dickens edited by Anne Perry. It’s a book of short stories using characters by Charles Dickens. I thought this was ingenious and thought I would actually enjoy the short stories. But then again I thought that when I bought a short stories book about wizards once too.. nada. Out of this book I have read 2 short stories. The first was so short I couldn’t find a storyline. The second fared a bit better for a storyline but they made Dickens sound like Sherlock Holmes!… needless to say I put the book down and read the above book of Graveminder… I may try another story at another time but for now I have way too many other books I’d rather give a try to..
As some of you might know, parts of Florida had more than it’s fair share of stormy rains over the weekend. It actually began on Friday, Saturday was the worst but Sunday got somewhat better (not as much rain) but still had winds up to 50 mph. and we had maybe 2 downpours intermittent with some sun. 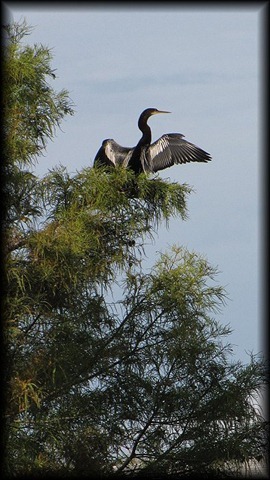 This morning (Monday) the sun came out and the wind had subsided so I went out for a look see. I was quite surprised. 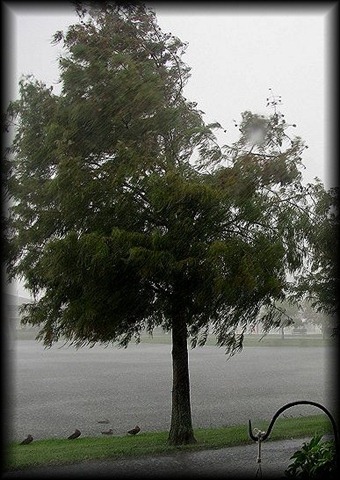 Many small branches from the trees were on the ground, but that wasn’t the surprise. The surprise was that I didn’t spot a single bird! Not one pesky Ibis!!! (unheard of!) Then I noticed some of my small plants knocked over .. with the wind we had I wasn’t surprised at all… until I went to set them back up and found this…. Ah well now. 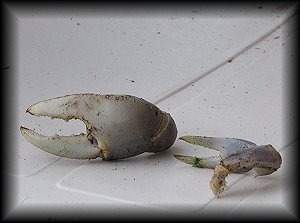 I would say there had been a crab by my apartment, and someone had a good meal! No signs of any more of the shell, just these two claws. There must have been a “struggle” and that’s how my plants were knocked down. I feel bad for the crab but someone had a good dinner! Another hour has passed and still no Ibis or other birds. I guess they got blown away and will take some time to return. Mostly I am waaay happy that the water level of the pond is receding! I was beginning to think I might need my water wings! (can’t swim.. heh). 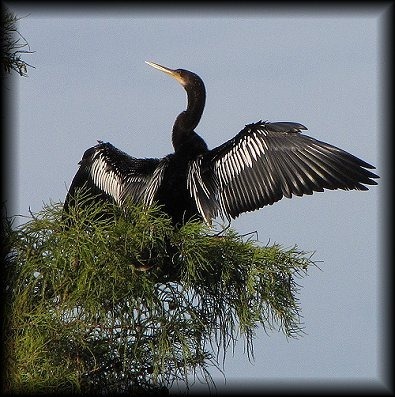 Anyway… that’s the “day after” at the pond!